Organizational Behavior and Public Management reveals how organizational behavior enables managers to direct resources that advance the programs and policies of public and government. This edition offers a public sector perspective of core topics, such as communication, decision-making, leadership, management ethics, motivation, organizational change, participation and performance appraisal. Contemporary Psychology called this book "skillful and comprehensive…There is a need for a text like this…the device of juxtaposing theory and application is a sound one." The authors discuss such topics as communication, decision making, worker participation and total quality management, organizational change, management systems, information, computers and organization theory in public management. "Praise for the Previous Edition . . .skillful and comprehensive. . . There is a need for a text like this. . .the device of juxtaposing theory and application is a sound one. " 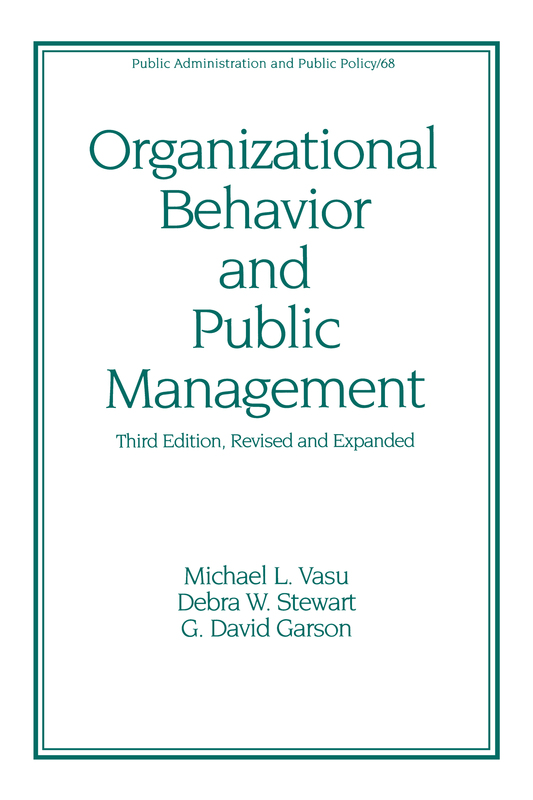 Introduction to organizational behaviour in the public sector; approaches to organization theory; motivation in organizations; leadership; role behaviour - individuals and groups; communication; decision-making; worker participation and total quality management; organizational change; management systems; information, computers and organization theory in public management; performance appraisal; management ethics.